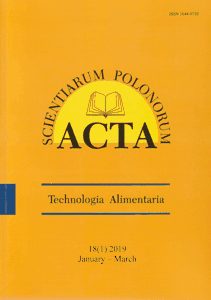 Acta Scientiarum Polonorum Technologia Alimentaria is a scientific journal founded in 2001 by all Polish Universities of Agriculture. Original scientific peer-reviewed papers published in Acta Scientiarum Polonorum Technologia Alimentaria journal cover the main aspects of food science from raw materials properties through processing aspects up to the quality of final products and their nutritional propoerties, usability and dietetics. Journal is affiliated with Faculty Food Sciences and Nutrition, Poznań University of Life Sciences. From 2009 is indexed by Scopus, from 2011 is indexed in Medline and from 2015 is indexed in Web of Science Core Collection - Emerging Sources Citation Index. This journal is an open access and non-profit enterprise. Published papers may be collected, read and downloaded free of charge, with the author's rights reserved. We have adopted a Creative Commons licence CC BY-NC (Attribution-NonCommercial) . Web of Science Core Collection - Emerging Sources Citation Index, Medline, Scopus, Scimago, PubMed, EBSCO, Food Science and Technology Abstracts®, CAB International, Chemical Abstracts Service, Index Copernicus, Ulrich's Database, Directory of Open Acces Journals, Agro-Librex, Agro-Agen, Agris-FAO, Embase, ProQuest, CrossRef, Scimago, HINARI. Acta Scientiarum Polonorum Technologia Alimentaria is scored 15 points in the Polish Ministerial List of Journals.